How about a pump application that involves the Cold War and Hollywood? On January 31st, 1963 in the Krasnoye Sormovo shipyard in Gorky, Russia the keel of a Juliett class cruise missile submarine K-77 (also referred to as the Juliett 484) was laid down. Two years later on March 11th she was launched and in the fall of 1965, commissioned into the Russian Navy’s Northern Fleet. The submarine was 282 feet long and equipped with 4 nuclear missiles capable of striking targets as far away as 300 miles as well as 22 torpedoes. For 30 years, this submarine patrolled North Atlantic Ocean, the Mediterranean Sea, and later in its career the coast of West Africa as well as the Caribbean Sea near the US Virgin Islands – often her time was spent following US Navy aircraft carrier battle groups and other submarines as well. After the end of the cold war, sometime post 1991 the K-77 was decommissioned. By 1994 all of the Juliett class submarines had been retired from the Russian naval fleet. In the spring of 1993, a Finnish businessman convinced the Russian government to sell him two Juliett class submarines, one of which was the K-77. The K-77 was moved to Helsinki where it became a bar / restaurant and was one year the location for a beauty pageant where a “Miss Submarine” was crowned – (the winner later became the Finnish businessman’s 3rd wife). The bar and restaurant wasn’t a very lucrative endeavour and at some point the sub was leased to a Canadian promoter who wanted to create a tourist attraction and the sub was towed across the Atlantic to Tampa, Florida. This effort never amounted to much and there were a couple of attempts to sell the submarine on eBay. 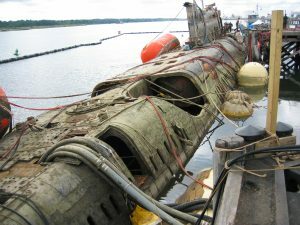 Eventually the submarine caught the eye of Intermedia Film Equities Ltd., who chartered the sub for $200,000 and had her towed to Halifax, Nova Scotia to be used in the filming of the movie K-19: The Widowmaker starring Harrison Ford and Liam Neeson. The K-77 was modified to resemble the correct K-19 sub for filming. After filming wrapped in 2002, the submarine was purchased by the USS Saratoga Museum foundation and was towed to Collier Point Park in Providence, Rhode Island. The hope was that the K-77 / Juliett 484 submarine and the USS Saratoga CV-60, a Forrestal-class supercarrier built in the 1950s that served the United States Navy from Vietnam through Operation Desert Storm, would someday be displayed together. During each vessel’s service to their respective nations, they spent plenty of time in the waters with one another. In fact there is a story about the President of the Saratoga Museum Foundation doing some research on the Juliett 484. He was in a bar drinking with former Juliett 484 naval officers when one of them produced a photograph of the USS Saratoga taken through the periscope of the sub further confirming that the two had spent time in the waters together during the cold war playing cat and mouse. The sub was actively used as a tourist attraction between August of 2002 and March of 2007 and hosted some 40,000 visitors to its deck and cramped interior. Interesting fact – sailors who served on the K-77 / Juliett 484 were required to be no taller than 5’8”. Then on April 18, 2007 tragedy struck. During a particularly vicious storm the sub took on enough water through some off its hatches to sink to the bottom of the waterfront mooring in the Providence River. In the more than 12 months it spend resting in the silt on the bottom of the river, it was determined that it was damaged beyond what could reasonably be repaired. Unfortunately the sinking brought about the eventual demise of the K-77 / Juliett 484, but it also brings us to the part where we had a hand in her story. On June 2, 2008 divers from Mobile Diving and Salvage Unit Two in Norfolk Virginia (Navy) arrived and began preparations to raise the submarine. They were joined by members of the US Army Dive Company based out of Fort Eustis, VA and in a unique joint effort, real world training opportunity, almost 100 active and reserve Sailors and Soldiers set about raising the sub off of the riverbed. 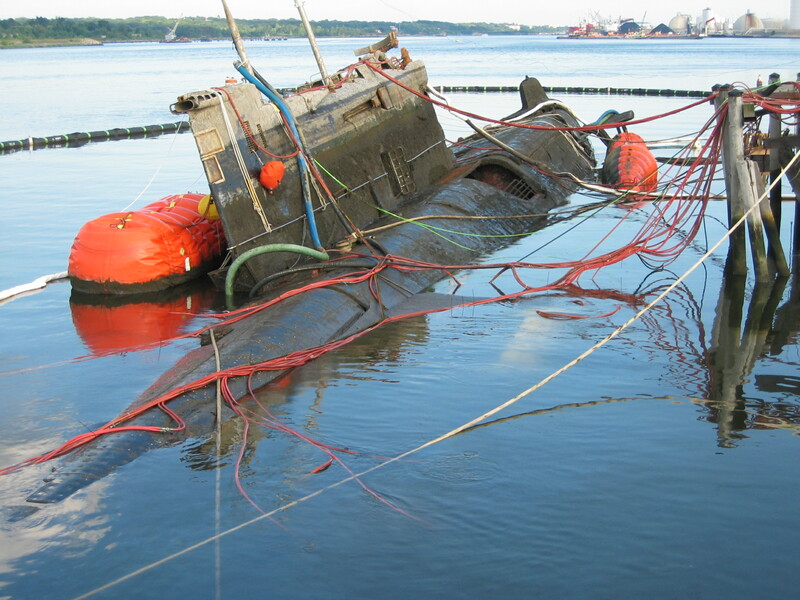 First the team sealed the hatches that had allowed water in and led to the sinking in the first place, used 8 hydraulically driven submersible dewatering pumps (some Hydra-Tech Pump models included) to remove the water from the inside of the sub while the submarine was raised via lift bands run under the sub and attached to pontoons. Once raised the assessment of the interior of the sub confirmed what was feared, that the time spent on the bottom of the river had damaged everything beyond what was economically feasible to repair / restore. Items like the periscope, torpedo tube doors, missile firing stations, engine order telegraphs and other instrumentation and controls would be removed and saved, but eventually the sub was sold to a scrap yard 1000 feet up river and was towed to its final resting placed were the 3500 ton behemoth would be cut apart for scrap metal.